Subject to the terms and conditions set forth below, members of Cigar Rewards will earn points in connection with the purchase of qualifying products online. Program Points accumulated under the Program are promotional and have no cash value. You must be age 21 years or older and a resident of the United States to be eligible for membership. Membership in the Program is limited to individuals only and is limited to one account per individual. To enroll in the Program, you must have an online account, provide an email address, your first name, last name, billing address, shipping address, and phone number. The Program is void where prohibited by law. A person may not be a member of more than one Cigar Rewards Program. Members are entitled to only one Member Account. Membership is Online. You may also apply to become a member of the Program by visiting www.thompsoncigar.com (the "Website" or "Online"). In order to apply on the Website, you must first be a registered user of the Website and have a user name and password. Becoming a Platinum Member. Members who spend $400 between January 1 and December 31 will earn Platinum status ("Platinum Member"). Platinum status is valid for the remainder of the year in which it is earned through December 31 of the following calendar year (minimum of twelve months, maximum of 24 months). For example, if a Member reaches Platinum status in June 2016, his status as Platinum is valid until December 31, 2017. Platinum Member Benefits. Platinum Members enjoy additional benefits and promotional offers such as: a 25% higher base earning rate (1.25 points for every one dollar spent), the ability to earn additional bonus points, and access to Platinum Member online events. All Platinum Member benefits and promotions are subject to the terms and conditions of the offer. Once you are a registered user of the Website, you may view a summary of your Account on the Website. After logging onto the Website, simply click on the "My Points" link in the header of the Website homepage. You may also view your Cigar Rewards points balance, progress toward Platinum Membership, transaction history on the Website by logging in and clicking on the "My Points" link in the header of the site. Members can earn Cigar Rewards points on the purchase of eligible products. For credit for your purchases you must be signed in and a registered user of the site. Members earn one (1) point for every one dollar ($1) spent when they purchase eligible products Online if the Member is logged into the Website. Points are rounded down. For example, if you spend $19.99, you will receive 19 points. Calculation is as follows: $19.99 x 1 point per dollar = 19.99 points, which is rounded down to 19 points. All Platinum Members earn points based on a 25% higher base earning rate (i.e., 1.25 points for every one dollar spent) than the Members’ rate. When a Member makes a qualifying purchase Online using a Thompson Cigar gift card as a payment type, the Member will earn points on the amount of the purchase. Gift card purchases are excluded and are not awarded points on orders when purchased. Addition of Points to Accounts. Points earned for qualifying purchases made Online will be credited within 72 hours after shipping. The timing for issuing points is subject to change. Members earn Cigar Rewards points only on the purchase price of merchandise, less promotional discounts & reward card payment (i) Calculation of Cigar Rewards points excludes payment by the Member for shipping charges and all taxes, including without limitation, federal, state, and local taxes or use taxes, and less the amount of a reward card payment type. Cigar Rewards points will not be earned on Machine Made Cigars (as of July 1, 2017), any discounts or other credits offered in connection with a product. For example, if a product that is normally $100 is on sale for $75, a Member will only earn points on the purchase price of $75. Purchases of gift cards, redemption of merchandise vouchers, and any type of price adjustments, including merchandise returns, use of cigar reward cards are not eligible for points. All purchases made: (i) by a Member prior to such member joining the Program will not be included in the points calculations. Purchases made online without a Member being logged onto the Website with the Member’s username and password, are not eligible for Program credit. Points earned for a purchase that is then the subject of a return, refund, returned check due to non-sufficient funds, or other credit will be deducted from the Member’s account. If due to an item return, the points amount will be deducted based on the fractional allocation of the return item’s retail amount paid compared to total amount paid for an order, including bonus points. It is possible a return will cause your Cigar Rewards account to have a negative point balance. From time to time, Thomponcigar.com may run certain bonus point promotions. Under bonus point promotions, Members can earn additional or "bonus points" in connection with the purchase of certain products or in connection with other promotional offers. Bonus point promotions are subject to the terms and conditions of the offer and may be offered at any time in Thompson Cigar’s sole discretion. Platinum Members may be able to earn additional bonus points in connection with any bonus point promotional offer. If a Member purchases a product during a bonus point promotion and the product comes with an additional, free product, bonus points will not be issued on the retail value of the free product. If a Member redeems points towards the purchase of a bonus point product and pays a portion of the retail price after the point’s redemption, the Member will receive bonus points on the leftover retail amount paid by the Member. If a Member redeems points towards the purchase of a bonus point product in an amount equal to the full price of the bonus point product, the Member will not earn any bonus points. From time to time, Thompson Cigar may offer you the chance to win various prizes, including points. There is NO PURCHASE NECESSARY TO PLAY OR TO WIN. Rules and restrictions will apply to such promotions. Points earned by a Member may be redeemed: (i) for products or discounts off products at Thompson Cigar provided a Member is using a minimum of 100 points, and (ii) for products or money off products Online. Points cannot be redeemed for discounts in our store or in our call center. Points can be redeemed in any increment amounts set forth above. Redemption of points towards purchases of products is subject to product availability. Members may redeem their points on any purchase made Online. To redeem points towards a purchase Online, a Member must be a registered user of the Website. Points may be redeemed on the purchase price of qualifying products only and cannot be used towards the payment of sales tax or shipping and handling charges or for the purchase of gift cards. Points accumulated on different Accounts of different Members may not be combined or aggregated to make purchases of products or for any other reason. Points earned in a transaction cannot be redeemed in the same transaction. Points expire 15 months after the month they were earned by the member. Example: Points earned in January 2016 will expire 4/30/17. By joining the Cigar Rewards Program, you agree to be bound by the terms and conditions set forth in these Program rules. As of July 1, 2017 Machine Made Cigars will not be awarded reward points. Thompson Cigar reserves the right to cancel, modify, or restrict Cigar Rewards or any aspect of the Program, including, without limitation, the point conversion ratio and the point expiration policy at any time. Any changes can be made without advance notice. Thompson Cigar may make these changes even though such changes may affect the Member’s ability to use points already accumulated. You are responsible for remaining knowledgeable about the Program Terms and Conditions. A Member’s points balance, as reflected in Thompson Cigar’s records, shall be deemed correct. Thompson Cigar reserves the right to determine the amount of points in any Member’s account based on Thompson Cigar’s internal records related to such Member’s account. In the event of an inconsistency between the amount accrued in a Member’s account as stated on any Member’s order receipt and Thompson Cigar’s internal records, Thompson Cigar’s internal records will control. Thompson Cigar assumes no responsibility for errors caused by incorrect Member information. Your right to transfer points earned or granted under the Program is strictly limited. The sale of points is prohibited and may result in the confiscation or cancellation of your points as well as suspension or termination of your membership, which in each case shall be final and conclusive. Thompson Cigar may revoke any Member’s membership in Cigar Rewards at any time if such Member engages in abuse of the Program or fails to follow the terms and conditions of the Program. Fraud or abuse relating to the accrual of points or redemption of rewards may result in revocation of membership in the Program and may affect a Member’s eligibility for participation in any other Thompson Cigar program. 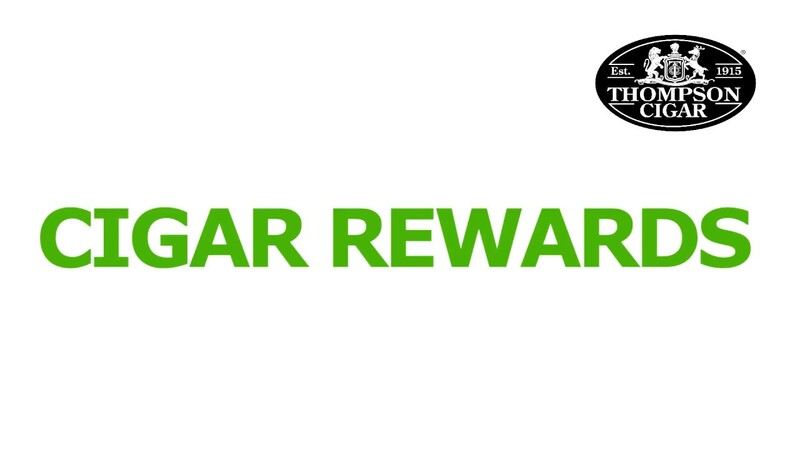 Cigar Rewards points are non-transferable and cannot be redeemed for cash. The interpretation and application of the Program’s Terms and Conditions are at the sole discretion and determination of Thompson Cigar. Important Policy Notice: Cigar Rewards points cannot be earned on Machine Made cigars as of July 1, 2017.